or use as a ‘swizzle stick’ in your next Bloody Mary! Break or cut off asparagus ends, allowing asparagus to stand in jar; about 3/4″ from top. 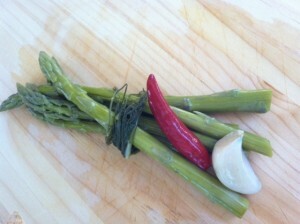 Fill clean, sterilized jars with raw ingredients; asparagus, dill, garlic & Peppers. Always remember to leave about 1/2″ at the top, as per canning instructions. When cooled, store jars in refrigerator for at least 2 weeks. In honor of Spring, & the dinner party I’m going to this evening- I’m creating a new cocktail, a special Lemon Drop Martini! Put cold water & zest in a saucepan & bring to a boil. Pour off water and repeat this process 3 times. Drain & set aside. Whisking to help dissolve sugar & add the lemon zest, bring to a boil over medium heat. Lower the heat & simmer until the peels get tender & translucent- this will take about 15 minutes. Pour off liquid & save. Let candied zest cool. Set aside. In a separate bowl toss the lemon zest with the remaining 1/2 c. organic raw sugar. Shake off excess sugar. Store zest in an airtight container until you garnish the Lemon Drop with it. This will store well for a few weeks- NOT! If you’re at all like me you’ll eat it all! Mix lemon juice, sugar syrup & vodka & basil in the martini shaker filled with ice. I love Tonic Water & ‘Q Tonic’ is so delicious- I met Molly from Q Tonic @ The Fancy Food Show last month. In cocktail shaker, add all ingredients except for tonic. Add ice, shake well and strain into chilled cocktail glass. Rinse two Cocktail Glasses with water and place in the freezer for a few minutes while you prepare the drink. Fill your Martini Shaker with the above ingredients, including the olives. Shake hard about 10 times, helping the Ojai Jalapeño Jelly dissolve. Remove Cocktail Glasses from freezer and pour out any excess water. In your Martini Shaker, shake the Ojai Habanero Jelly with the vodka & ice until the Jelly has dissolved completely. Then strain off any Pepper bits with a tea strainer. Garnish. The recipe I prefer involves making fresh cranberry sauce & saving the left over liquid for future martinis. On that outing I had my first lemon drop made in a pickle jar, & what a tasty cocktail it was! a large jar with a lid- like a pickle jar that cannot smell of pickles! Wash the lemons, then roll them a few times on a cutting board or counter top, to activate the oils in the skin- Squeeze the lemon juice into the large jar & then toss in the remains of the lemon, skin & all. Add sugar, mint, vodka, and lots of ice and shake it until you see the sugar has dissolved. For the holidays I make cranberry sauce with fresh cranberries, orange juice, sugar, lemon zest & a cinnamon stick. 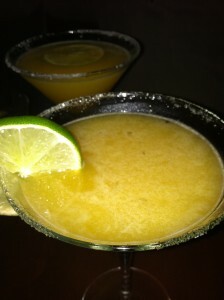 I shake it with ice in a martini shaker, strain it & serve… It’s been a hot holiday hit!